Digital Monster Ver. 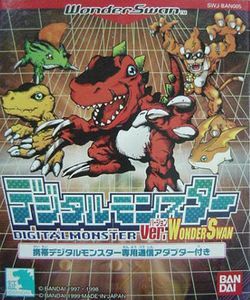 WonderSwan is a Japanese handheld version of the original Tamagotchi-like Digimon pet for the WonderSwan. It includes all of the original Digimon from the five different pet devices. In this game the player can have up to five different Digimon with them at a time. It even has computer controlled opponents to battle with. The game has the ability to connect to another WonderSwan through a special link cable. It can also hook up to the original pets through a Digimon "dock N rock" connector that comes packaged with the game. Digital Monster Ver. S: Digimon Tamers did much the same thing, only on the Sega Saturn. This page was last edited on 23 June 2013, at 00:25. This page has been accessed 11,995 times.